You will need graph paper for the designs and then separate sheets for the team to recreate the designer's image. 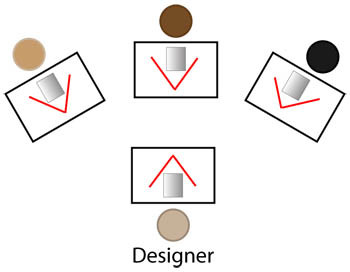 Each person needs to create a design in preparation for acting as designer. Without making anything visible to anyone else in the team, each learner draws some axes on graph paper and creates an image by joining coordinates, or drawing lines. The designer recreates their image so that it is hidden from the rest of the team but as s/he makes the design, s/he explains each step. This needs to include information on axes and scale as well as coordinates of points and equations of lines. The aim is for the rest of the team to make a copy of the same design. Mathematical reasoning & proof. Cartesian equations of circles. Dynamic geometry. Reflections. Coordinates. Cartesian equations of lines. Rational and irrational numbers. Interactivities. Gradients. Team-building.